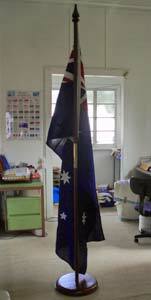 Aluminum indoor flagpole 2.4 metre, Grey finish Price: $75.00 Qty. 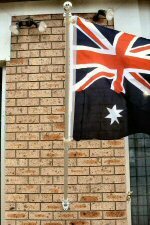 Aluminum extendable flagpoles 2.4 metre Price: $190.00 Qty. 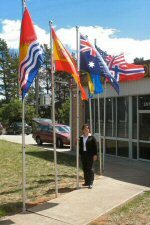 Aluminum extendable flagpoles 5.0 metre Price: $325.00 Qty. 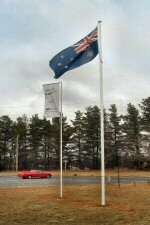 Aluminum extendable flagpoles 6.0 metre Price: $355.00 Qty. 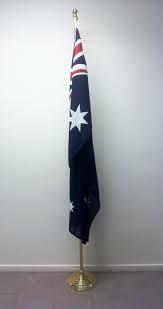 Tasmanian Oak timber flagpole 2.4 metre, ( Finial flagpole top) Price: $265.00 Qty. Tasmanian Oak finish flagpole square base, 1 or 3 holes Price: $243.00 Qty. Aluminium flagpole secure lock internal rope , inc hinged base Price: $2395.00 Qty. Allum flagpole 6mt. secure lock int. rope & spigot base fixing Price: $1315.00 Qty. Flagpole installation (upon request) Price: $0.00 Qty. Service call for repair and maintenance Price: $95.00 Qty. 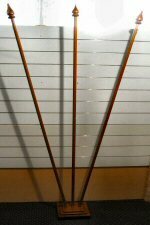 Hand held extendable flagpole 1.2 mtr Price: $19.50 Qty.